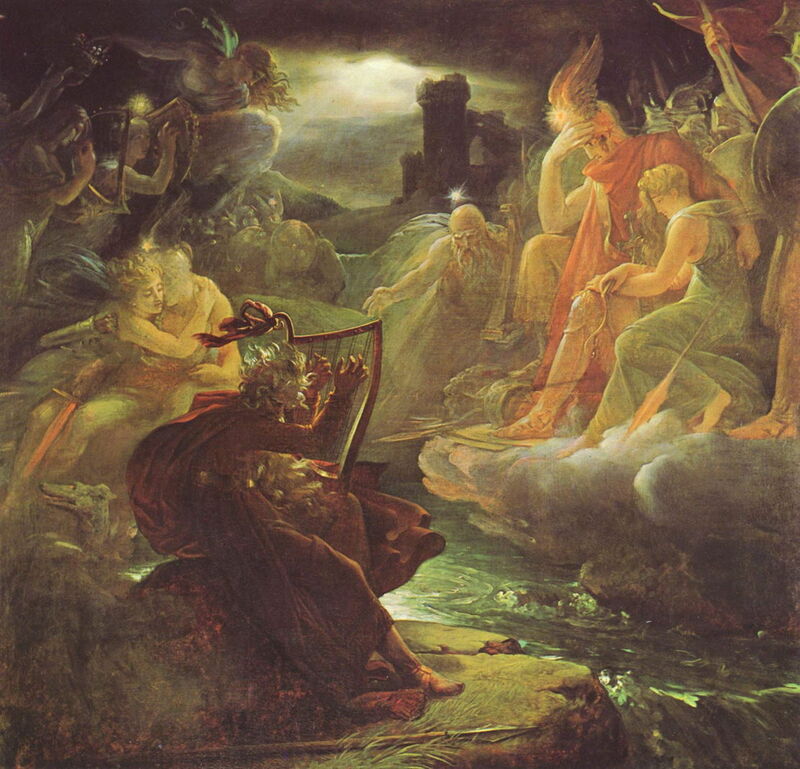 Ossian: The painting of a literary hoax? Anne-Louis Girodet de Roussy-Trioson (1767–1824) (attr), Apotheosis of the French Heroes Who Died for the Fatherland during the War of Liberation, Ossian receiving the Ghosts of the French Heroes (c 1801), oil on canvas, 192 x 182 cm, Musée national des châteaux de Malmaison et de Bois-Préau, Paris. Wikimedia Commons. There have been plenty of hoaxes in painting, almost invariably over the identity of the artist (or forger) who painted a specific work. It’s unusual for most of a generation of painters to be caught up in someone else’s forgery, but around 1800 that is exactly what happened. This article explains how masters including the great French narrative painter Ingres were duped. The eighteenth and nineteenth centuries were times of great discovery, but relatively limited critical examination of new ‘discoveries’. The sciences and technologies used to examine the origins of works of art were not well developed, and there was a tendency to trust ‘gentleman’ scholars of the day. In 1760, the Scottish poet James Macpherson published a cycle of epic poems translated into English from their original Scottish Gaelic. He claimed to have collected these from oral sources, then rendered them into modern Gaelic – a process similar to that used about fifty years later by Elias Lönnrot to compile the Finnish national epic, the Kalevala. 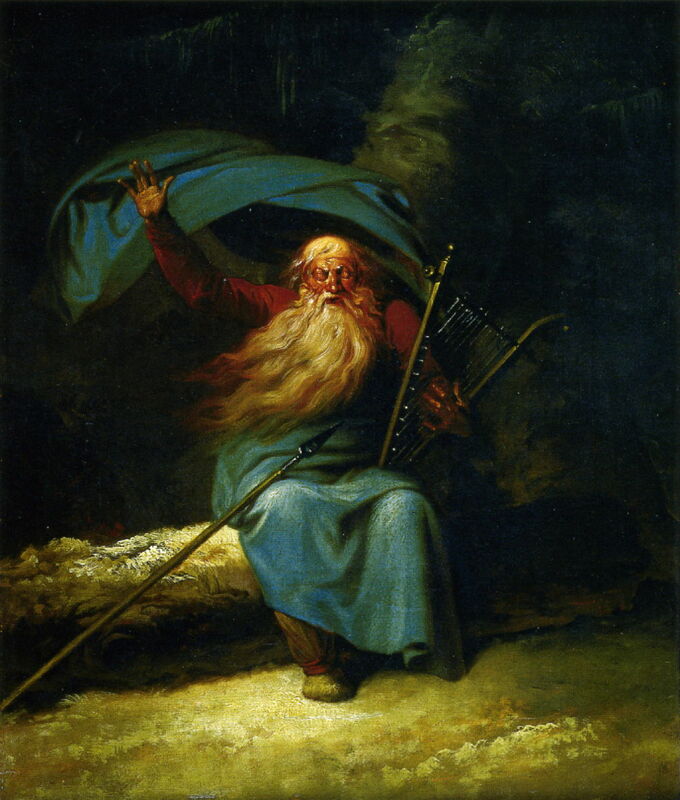 The central character in Macpherson’s epic is Ossian, who was based on a pre-existing legendary Irish Gaelic bard Oisin. Macpherson’s new and exciting extensions to the corpus of Celtic/Gaelic folklore and myth came from Ossian’s retelling of endless battles and unhappy loves from his earlier days. By the time that Macpherson published his collected edition of the poems in 1765, several characters had emerged from their rather fragmented narrative. Ossian’s father Fingal appeared based loosely on an existing hero from Irish Gaelic tradition, Fionn mac Cumhaill (‘Finn McCool’), and there were Ossian’s dead son Oscar, and Oscar’s lover Malvina. The first names Fiona and Malvina first appeared in Macpherson’s Ossian writings. These had initially been translated into English and then, taking Europe by storm, into the other major languages of Europe. Their French translation was completed by 1777. When Macpherson died in 1796, so great was his fame that he was buried in Westminster Abbey. Yet today Ossian and Macpherson’s momentous discovery have been all but forgotten, and are generally excluded from accepted Celtic/Gaelic tradition. 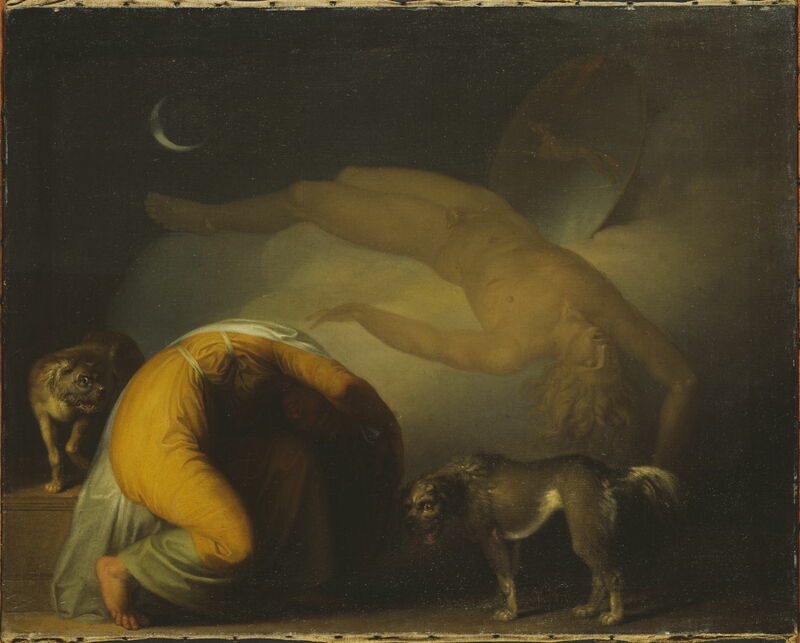 Nicolai Abildgaard (1743–1809), Fingal Sees the Ghosts of His Ancestors in the Moonlight (1778), media and dimensions not known, Statens Museum for Kunst, Copenhagen, Denmark. Wikimedia Commons. The prolific narrative painter Nicolai Abildgaard wasted no time in reading Ossian and retelling the stories in paint. 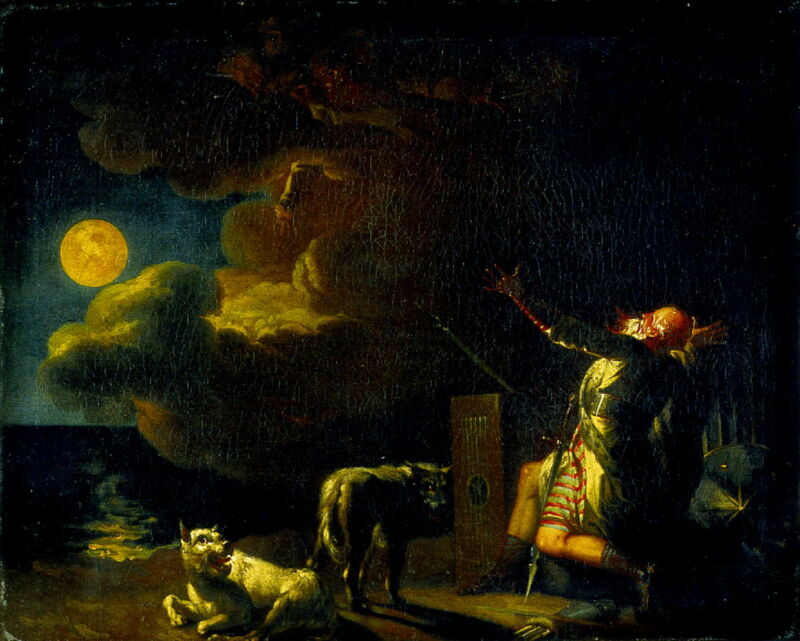 His Fingal Sees the Ghosts of His Ancestors in the Moonlight was completed in 1778, and a suitably Romantic expression. Nicolai Abildgaard (1743–1809), Ossian’s Swansong (c 1782), media and dimensions not knonw, Statens Museum for Kunst, Copenhagen, Denmark. Wikimedia Commons. Abildgaard went on to assemble a whole series of works painted from the lines in Ossian. Later came Ossian’s Swansong from about 1782. Nicolai Abildgaard (1743–1809), Culmin’s Ghost Appears to his Mother (c 1794), oil on canvas, 62 x 78 cm, Nationalmuseum, Stockholm, Sweden. Wikimedia Commons. In about 1794, Abildgaard added Culmin’s Ghost Appears to his Mother. Between 1790-1815, Europe and North America reached peak Ossian. In France, Napoleon and Diderot were fans, and Voltaire wrote parodies. Thomas Jefferson intended to learn the Scottish Gaelic language to read them in their original form, and some compared Ossian with giants such as Homer. Among the painters who told stories from Ossian in their work were JMW Turner and JAD Ingres. 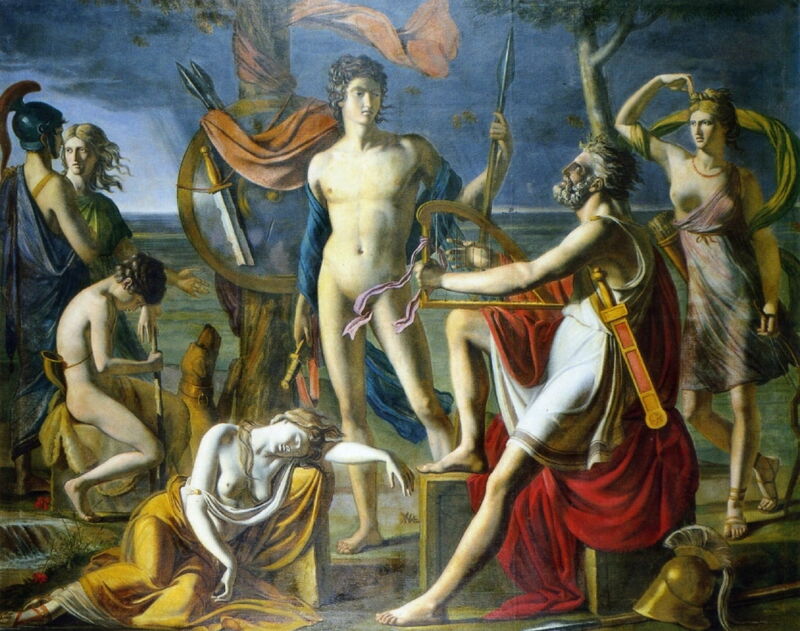 Paul Duqueylar (1771-1845), Ossian Reciting His Songs (1800), oil on canvas, 273 x 347 cm, Musée Granet, Aix-en-Provence, France. Wikimedia Commons. In France, it was the now-forgotten narrative painter Paul Duqueylar who stole the limelight at the 1800 Salon in Paris, with his Ossian Reciting His Songs (1800). 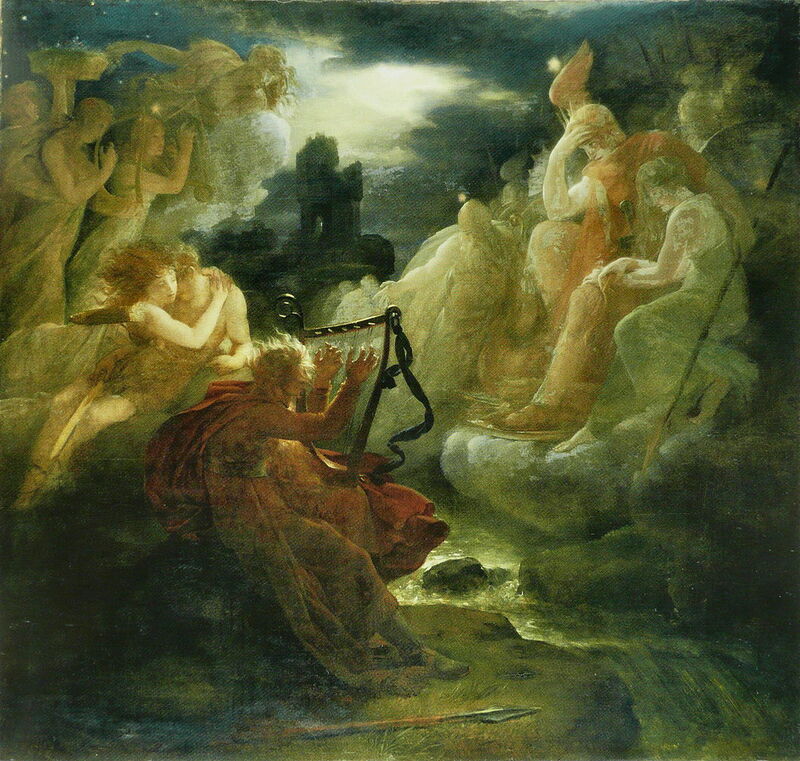 François Gérard (1770–1837), Ossian on the Bank of the Lora, Invoking the Gods to the Strains of a Harp (1801), oil on canvas, 180.5 × 198.5 cm, Musée national des châteaux de Malmaison et de Bois-Préau, Paris. Wikimedia Commons. 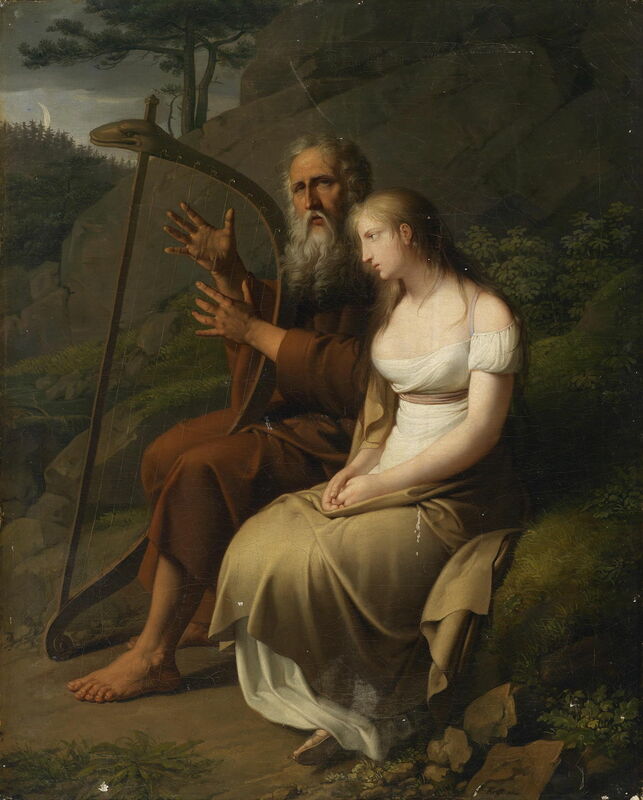 The following year, François Gérard painted Ossian on the Bank of the Lora, Invoking the Gods to the Strains of a Harp (1801). Later, after Napoleon had fallen from power, Gérard’s original was sold to the King of Sweden and was lost in a shipwreck during delivery. Gérard painted several replicas, including that above which is now in the Châteaux de Malmaison, Paris, and that below which is in the Kunsthalle Hamburg. François Gérard (1770–1837), Ossian on the Bank of the Lora, Invoking the Gods to the Strains of a Harp (c 1801), oil on canvas, 184.5 × 194.5 cm, Kunsthalle Hamburg, Hamburg, Germany. Wikimedia Commons. Anne-Louis Girodet de Roussy-Trioson (1767–1824) (attr), Ossian receiving the Ghosts of the French Heroes (study) (c 1805), media and dimensions not known, Musée du Louvre, Paris. Wikimedia Commons. Anne-Louis Girodet de Roussy-Trioson, known simply as Girodet, decided to conflate Ossian with a politically-motivated list of ‘French heroes’. 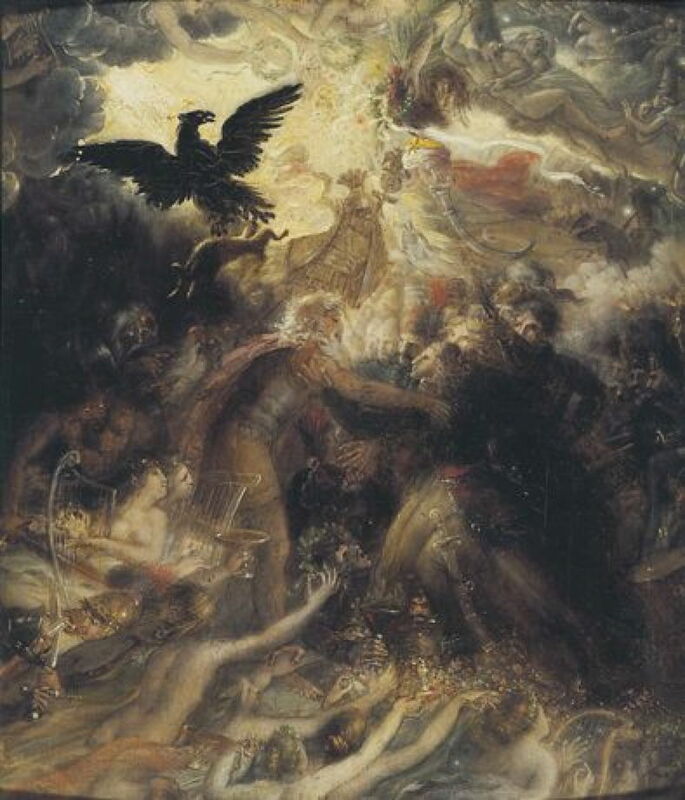 His study for this, Ossian receiving the Ghosts of the French Heroes is claimed to be from 1805, but might more realistically be dated to 1801. 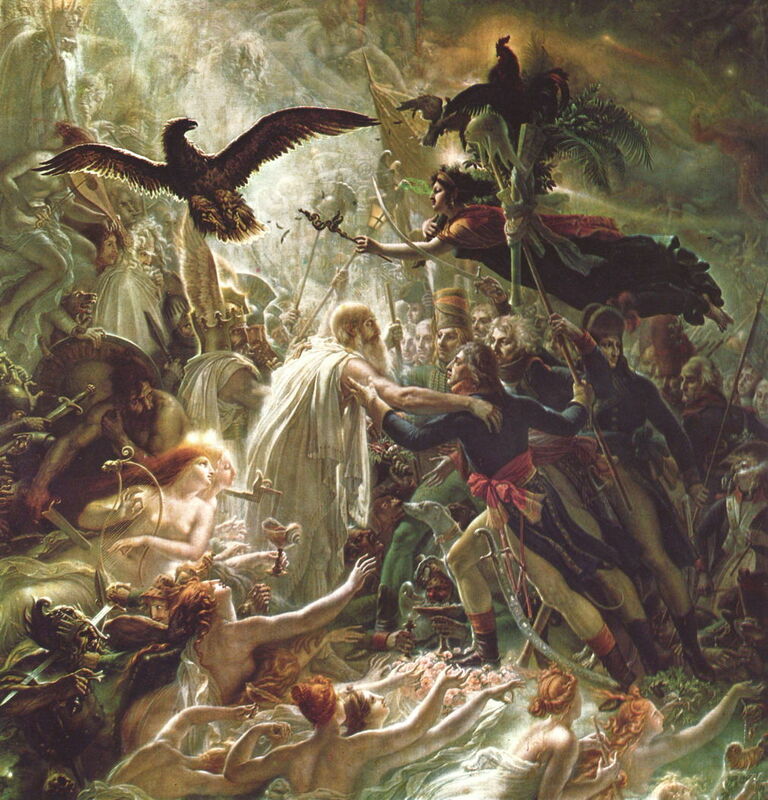 Girodet’s finished painting was given the dual title of Apotheosis of the French Heroes Who Died for the Fatherland during the War of Liberation, Ossian receiving the Ghosts of the French Heroes and was probably completed in 1802. It is perhaps the most elaborate and complex painting inspired by Ossian. Johann Peter Krafft (1780–1856), Ossian and Malvina (1810), oil on canvas, 66.5 x 53.5 cm, location not known. Wikimedia Commons. Later paintings focussed their attention on the young and beautiful Malvina, who was caring for the old and blind Ossian. Johann Peter Krafft’s Ossian and Malvina from 1810 shows the two together. 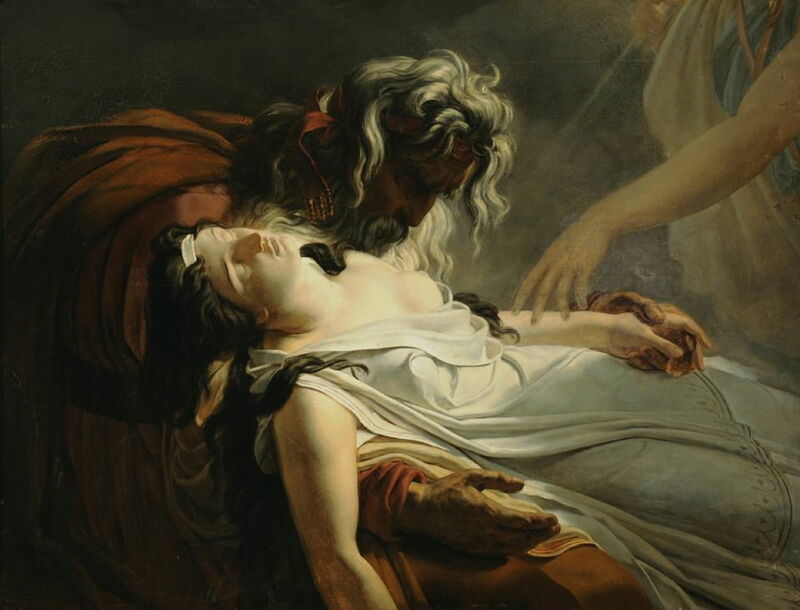 Ary Scheffer (1795–1858), The Death of Malvina, or Ossian Receiving the Last Breath of Malvina (1811), oil on canvas, 113 x 147 cm, Musée Auguste Grasset, Varzy, France. Wikimedia Commons. Originally attributed to Girodet, it is now though that Ary Scheffer painted The Death of Malvina, or Ossian Receiving the Last Breath of Malvina between about 1802 and 1811, although this looks suspiciously as if its canvas has been cut down. Jean Auguste Dominique Ingres (1780–1867), The Songs of Ossian (1811-13), ink and watercolour, dimensions and location not known. Wikimedia Commons. The young JAD Ingres made his first drawing of an Ossianic motif when he was still a student in Rome, in 1809. Shortly after his return to Paris, he was commissioned to paint two works for the bedroom to be used by Napoleon when he visited Rome. 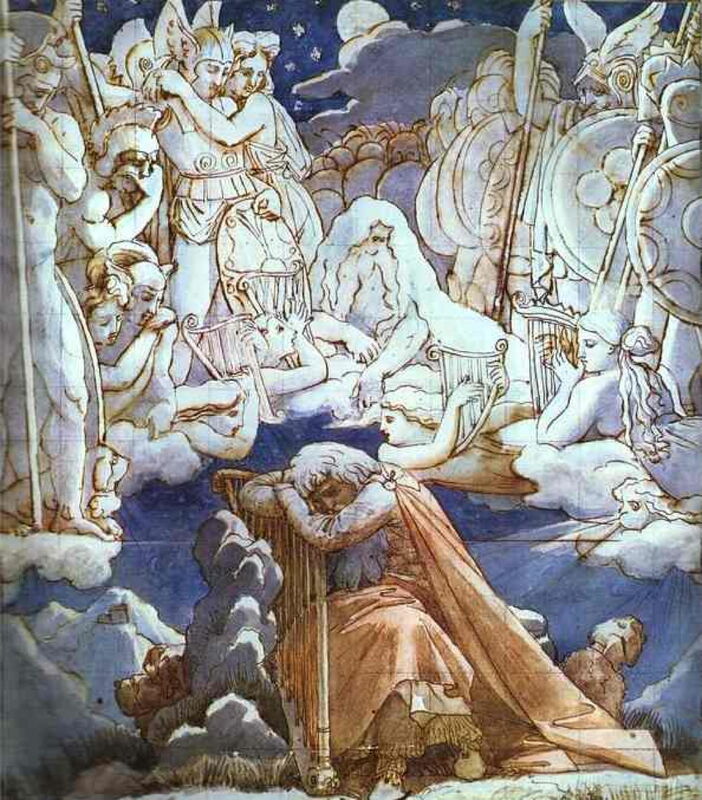 The Songs of Ossian (1811-13) is his ink and watercolour study for the painting that was to be drawn from Ossian. Jean Auguste Dominique Ingres (1780–1867), Ossian’s Dream (1813), oil on canvas, 348 x 275 cm, Musée Ingres, Montauban, France. Wikimedia Commons. Ingres completed the finished work in 1813, and it is probably the best-known painting based on Ossianic stories. 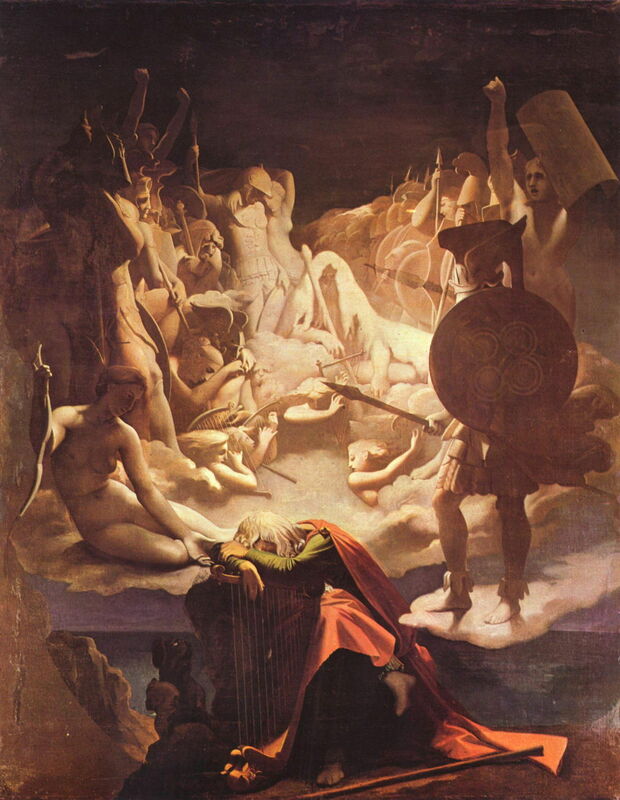 It shows an episode from Ossian’s epic, with the aged Ossian asleep on his harp, dreaming in monochrome of past wars and loves. In a sense, it should not have mattered whether the original Ossianic myths were genuine or not. These paintings depict stories which, at the time, had general currency among those likely to view them. However, when Ossian fell from favour later in the nineteenth century, their literary references were forgotten, and their narrative lost. Macpherson’s claims were disputed from the moment of their first publication. Among their greatest sceptics was Samuel Johnson, at the time one of the authorities on the English language and its culture. A committee was set up by the Highland Society which attempted to establish the authenticity of Macpherson’s sources. While that was deliberating, an Irish manuscript came to light which conflicted with the claimed myths of Ossian. By the middle of the nineteenth century, although Macpherson wasn’t regarded as a complete fraud, there was sufficient doubt over his claims that Ossian lost its previous popularity. If Macpherson didn’t engineer a hoax, he doesn’t seem to have represented the origin of the Ossianic writings entirely accurately. Their bubble had burst, and all those fine paintings were victims. Posted in General, Language, Life, Painting and tagged Abildgaard, Duqueylar, Gérard, Girodet, Ingres, Krafft, myth, narrative, Ossian, painting, Scheffer. Bookmark the permalink. English being the key word. Johnson was rather racist and a Brummie and anti-Celtism has long been ingrained in English culture. The tragedy of the Ossianic Cycle is not one of forgery, but of artistic tinkering with traditional stories leading to the baby being thrown out with the bath water. Yes, Johnson was English and not a Celtic scholar by any means, but his opinion was very influential at the time, however biased or even bigoted he might have been. For most of us, evidence that the claims made by Macpherson, and maintained by him up to his death, were not actually truthful is sufficient to reject whatever he said and wrote. Trying to recover any underlying truth from lies, particularly when those involved are long dead, is a highly speculative matter. Yes I would agree with that but the problem is it is a case of McPherson versus his critics suspicions. The only one who really knew whether he was true to hid sources was the writer. The authenticity of the work as a representation of folk stories that were recorded by MacPherson really rises or falls upon whether the man was a honest or a dishonest man. The fact that his work conflicted with some Irish sources does not necessarily mean that it was not what he portrayed it as, but rather would reflect the fact that storytellers tend to elaborate and diverge the same story over generations if they become geographically or otherwise separated. I was taught at school that Geoffrey of Monmouth was a fantastical liar who history of Britain was nothing but fairy tales, but the more I have studied things that relate to this ridiculed history the more correlations between it and actual events I have found. I think the best parallel is with the Kalevala. Lönnrot was quite open about what he had done, and I believe his original records were all made available. There was certainly a vast amount of supporting collected oral materials from others in the field. As I understand it, MacPherson never made any of his original materials available, and claimed that what he published had been translated by him from those, including from manuscripts. But none of those original records or manuscripts has ever been found. All the evidence points to them never existing, or what notes he may have made being destroyed by him. Even for that time, that reeks of dishonest dealing at best, and possibly complete forgery. Without those original notes and manuscripts, it is impossible to know what he created and what might have come from his claimed sources. At least with Lönnrot there is still sufficient original material and evidence to estimate his personal contribution. With Ossian, that’s just not possible. So putting any credibility in its authenticity is complete speculation, and will remain so now forever. That’s no way to conduct ethnographic or literary research. But, as I write above, in the context of paintings it shouldn’t actually matter. Ovid’s Metamorphoses were of course completely mythological at best, but paintings of them remain justly popular and very meaningful. That begs the question as to why the same isn’t true of Ossian, for which I think the paintings above provide the answer.